Hargitai, R.- Farkas, Ö.- Ropolyi, L+.- Veress, G.- Vankó, Gy. Tetralectics is a new type of logic with a novel way of validation and a demand for a three dimensional geometrical representation, a metatheory for scientific theories, a logic of scientific theory-building. Its intellectual background includes the causal theory of Aristotelian philosophy, Hegelian dialectics and the postmodernist preference for plurality. The rich heritage of them allows tetralectics to become a method for treatment of several different corepresented oppositions. The four Aristotelian causes are transformed into four reinterpreted concepts, which are arranged in tetrahedron-form and their relations are analysed applying the symmetry properties of this perfect body. The symmetry elements of the tetrahedron represent oppositions. The four concepts, their arrangement, the oppositions and the assignment of the oppositions make up the formal system of tetralectics. In the system of tetralectics, treatment of the difficult consequences of the interrelatedness of elements of knowledge reveal that the central concepts have the characteristics of metatheories. These metatheories in the tetralectics of natural sciences are: material, space-time, action and change. The metatheories are comparable to conventional theory families of sciences. The division of the central concepts into sub-concepts facilitate the construction of a specific theory. The three level description of tetralectics allows the development of a new validation of statements, and crosswalks between the (meta)theories created by symmetry adopted transformations guarantee a flexible nature to tetralectics, in this context the Gödel argumentation has a more friendly face. The aim of the different sorts of logic is to arrive at the general rules of reasoning. To achieve this, a logic has to represent all the relations between the constituents of the given logical universe. The proper representation of a given logical structure can significantly stimulate a deeper understanding of the similarity and dissimilarity of different logics. But what is the suitable representation of these relations? If one tries to represent the main known logical systems geometrically, only some very simple geometry can be applied. Most logics have only one –in some cases two– dimensional representations. This is sufficiently illuminative in the case of most logics, but unable to reflect the rich logical context of many real situations. For example: how can we represent the multiple connections of a scientific concept? Tetralectics suggests a solution: to move over to the third dimension. So tetralectics is a logic in three dimensions. Figure 1. 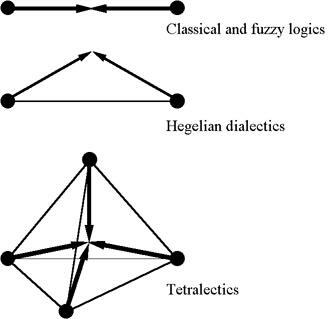 A possible representation of the classical and fuzzy logics, Hegelian dialectics and tetralectics. Figure 2. Different classes of oppositions in tetralectics. Figure 1. shows one dimensional representation for classical and fuzzy logics, a two dimensional for Hegelian dialectics and a three dimensional for tetralectics. The way in which each logical system treats the oppositions and their relations is characteristics. Therefore, we depict the oppositions coexistent in the same logical system as pairs of arrows which meet at their peak. The directions of the arrows show the functioning of the oppositions. Different methods are applied in these different logics at the treatment of the problem of the coexistent opposites, as it can be seen in Figure 1. We can call the classical and fuzzy logics one dimensional since both the starting points and the concluding point can be put on one line. In Hegelian dialectics the emergent concept has new qualities as compared to those of its determinant oppositions. The concluding point cannot be represented in terms of the starting points, therefore, it opens a new dimension. Thus the system of the starting and concluding points span a two dimensional space. Tetralectics uses not two, but several oppositions. To hold them together and to express their sophisticated relations, we arrange them on a tetrahedron, thus we need a three dimensional representation. In fact, there are three different classes of oppositions in tetralectics (which cannot be distinguished in Figure 1. ), namely, the edge, axis and face oppositions in the order of their appearance in Figure 2. In this figure the similarities and dissimilarities between the dialectical and the tetralectical treatment of oppositions can be considered. Each edge opposition is equivalent to one in Hegelian dialectics (we also call these oppositions 1 - 1 oppositions), each axis opposition composed of two Hegelian dialectical one (these are the 2 - 2 oppositions), and each face opposition (1 - 3) link three Hegelian dialectical oppositions. Tetralectics possesses 6 edge, 3 axis and 4 face oppositions - as we can see later. There we will use a maybe more transparent notation for these classes of oppositions. As an important consequence of this choice the strict unambiguity of the logical manipulations is lost and a special type of plurality appears in tetralectics. For example: a scientific concept embodied in a theory has many - but very different - relations to other scientific concepts. Following the logic of the standard way of scientific theory building, this complex context of concepts must be essentially simplified. Tetralectics suggests a treatment for the contextual plurality of concepts. The objective of tetralectics is to collect the greatest possible number of oppositions of the system studied, to keep them together and to let them work. The results of their work, i.e. the more perfect description of the system in question can not be derived from one theory, but a class of interrelated theories. Tetralectics suggests a treatment for a plurality of theories. This treatment for plurality includes a new way of validation, which will be described in the chapter concerning the levels in tetralectis. In such a way tetralectics is a postmodern logic. This allows, for example, the structure of a scientific theory to be analysed. Tetralectics can be used to analyse and build scientific theories possessing many different logical structures. In this sense tetralectics is a logic of theory building. It is an obvious statement that tetralectics refers to the mental representations of reality and not the reality itself. Therefore, if we can find some general rules, some regularities in the context of tetralectics, these relations will be valid for scientific theories and not for reality in a direct way. Tetralectics is a metatheory or a version of general systems theory. As in the case of other logics, tetralectics also has a formal and a non-formal aspect. The formal aspect aims to establish the rules or laws of treating and keeping together the diverse oppositions, while the non-formal deals with an actual interpretation of a formal theory, that is to take into account the actual meaning of the opposites. In what follows we tend to separate the general rules and working of tetralectics (the syntax of tetralectics) from its interpreted version (the semantics of tetralectics) applicable to natural sciences. However, this separation seems difficult to us because the development of tetralectics was a consequence of a continuous re-thinking of unsolved problems of natural sciences. We accept the universal validity of the Aristotelian causal theory in the world of theories. Of course, it seems useful to re-interpret the four Aristotelian causes in our time. However, only the maintenance of four concepts has significance in the formal side of tetralectics, even the original Aristotelian concepts (or any other reasonably chosen four concepts depending on the subject matter of the analysis) could be used in it. On the other hand, our reinterpretation presented below can be used for a tetralectics applied to natural sciences and so leads to the set of tetralectical concepts for theory building in natural sciences. Of course, many other versions of reinterpretation can be constructed. Our choice is motivated by our detailed analysis of these scientific concepts which will not be presented here. Applying the above abbreviations, the version of tetralectics based on this scientific interpretation will be called the tetralectics of MASC (or simply MASC). We accept the universal validity of the Hegelian view on the contradictionary nature of beings. However, in Hegelian dialectics, the prominent role is played by a pair of oppositions, whereas in tetralectics we prefer the consideration of many pairs of oppositions studying both the formal and scientific conceptual contexts. In a tetralectics, of course, the different oppositions are not equally treated. The different oppositions may be represented by different symmetry elements of tetrahedron, since their behaviour in tetralectics may also differ. A symmetry operation transforms some of the oppositions to others while leaving some others unchanged. All of the four Aristotelian causes can be regarded as the coexistence of a number of certain kinds of oppositions. Tetralectics is a method for the treatment of several different corepresented oppositions. We accept the universal validity of the plurality preference of postmodernism in all the areas of human activity including science. Tetralectics gives more than one valid description of an investigated object, but these form a unity in tetralectics. Tetralectics does not lose true statements in general but it tries to construct different contexts for them. The demand for plurality is a common feature in the Aristotelian and in the postmodern view of the world. However, unlike tetralectics, neither Aristotelian, nor postmodern philosophies construct an exact treatment for plurality. In tetralectics the plurality is put into a geometrical context. These aspects can be shown in a possible way drawing an adequate tetrahedron, as it can be seen in Figure 3. The formal system of tetralectics consists of four central concepts, a definite number of oppositions, a three dimensional tetrahedron with its symmetries, a concrete arrangement of the central concepts on the vertices of the tetrahedron and the assignment of the pairs of opposites to the symmetry operations of the tetrahedron. In order to evolve the system of tetralectics in a more plausible way, here we will use a scientific representation of the tetralectical system instead of the more formal description. In such a way the four Aristotelian causes are reinterpreted and applied as the very basic concepts of this implementation of tetralectics. 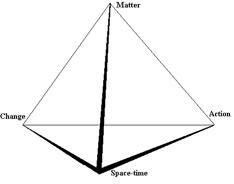 As we mentioned earlier, the Aristotelian concepts of matter, form, efficiency and aim are transformed into the concepts of matter, space-time, action and change. These concepts are arranged in a tetrahedron-shaped form and their relations are analysed applying the rich symmetry properties of this perfect body. The edges and symmetry axes of a tetrahedron represent the basic oppositions (e.g. finite-infinite, discrete-continuous, open-closed, local-global, static-dynamic, etc.) that we use in our scientific analyses. An arrangement of the oppositions is shown in Figures 4 to 6. The concepts and their relations represented in Figures 4 - 6 completely define a tetralectics of natural sciences, i. e., the tetralectics of MASC. Since symmetry plays such a crucial role in tetralectics, here we present a brief review of the connections between the oppositions and the symmetry of the tetrahedron. At first we use the edge oppositions to give an impression of the use of symmetry, then we give a second, maybe more elaborated approach. The symmetry operations of the tetrahedron are described in the first table. Each reflection (σ) leaves one edge opposition unchanged and another reversed. 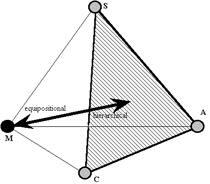 If we take the plane containing the vertices M and S and the point halving the A-C edge, reflection through this plane leaves the M-S edge (the discrete-continuous opposition) unchanged, A-C (global-local) reversed, and mixes the other oppositions (e.g. A-S C-S, M-C M-A, etc. ; cf. Fig. 4.). 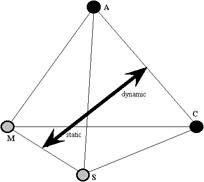 Figure 6. helps us to find a C2 axis of the tetrahedron, since the MS-AC (static-dynamic) axis opposition that is shown there lies on one of these C2 axes. The C2 operation reverses the two edge oppositions which the C2 axis goes through, namely, the M-S (discrete-continuous) and A-C (global-local) and mixes all the other the edge oppositions (e.g. A-M C-S, M-C A-S, etc.). The S4 axes are coincident with the C2 axes, which is not surprising since S4 applied twice yields C2 (S42 = C2). The S4 operation mixes all the edge oppositions (e.g. A-M S-A, M-C A-M, etc.). The equipositional-hierarchical (M) face opposition shown in Fig. 5. lies on one of the C3 axes. The C3 operation mixes all the edge oppositions (e.g. A-M S-M, S-C C-A, etc.). Finally, E, the identity operator leaves every opposition unchanged. * coincident with the C2 axes. The above mentioned property of the mirror planes, which may make finding the proper assignment more difficult, draws our attention to the necessity of axis and face oppositions. To make this clear, let us consider the example of the face (1-3) oppositions. Let us choose one vertex of the tetrahedron. There are three mirror planes which contain it. They also contain the three edges [(1-1) oppositions] connecting the chosen vertex to the other three. The equivalence of these three connections along the edges (which is also supported by the C3 symmetry element) shows that this vertex has a special relationship to the triangle formed by the others, which the edge oppositions cannot express. Similar conclusion can be drawn in the case of the (2-2) oppositions as well. Besides the properties described above, σ, C2 and S4 have a special feature, which may add some peculiarity to the oppositions assigned to them, namely, that they change the polarity of some of the oppositions not invariant to them (and S4 even swaps some oppositions), adding new elements to the relations between the oppositions. At this stage of the development of MASC presented here these relations have no crucial role, therefore we will disregard some of them. All the relevant assignments in MASC are shown in Table 2. Here we present some general aspects of the tetralectics of MASC and those special versions of metatheories which can be constructed on the basis of this tetralectics. As it follows from the preceding ideas, the tetralectics of MASC consists of four central concepts (M, A, S and C), 13 pairs of oppositions (6 edge, 3 axis, and 4 face oppositions; specified in Figures 4. - 6. ), a tetrahedron with its symmetry elements given in Table 2., and the arrangement and assignment of these constituents presented in Figures 4. - 6. A symmetry element, which is not assigned to any specific opposition, the identity (E), represents the whole selected and assigned system of oppositions of the given version of tetralectics. Those pairs of oppositions were chosen into the class of edge or (1 - 1) oppositions whose constituents determine each other without any other relations, as in the cases of discrete - continuous or homogeneous - inhomogeneous. The conceptual structure of the axis or (2 - 2) oppositions is more complicated, because they are basically connected with two pairs of edge oppositions. For example, the meaning of static - dynamic pair of concepts is influenced by both the discrete - continuous and the global - local oppositions. These relations call attention to the understanding of the concept of static as a result of the coexistence of the discrete - continuous and global - local oppositions. This is an unusual aspect of this concept, so its appearance in tetralectics makes our conceptual analysis more sensitive and complex. Of course, the situation is the same in the cases of the other axis oppositions, too. As it was mentioned earlier, the face (1 - 3) oppositions unify three pairs of edge oppositions. This relation emphasises the very rich conceptual content of the face oppositions. For example, the meaning of the quantity - quality oppositions is influenced by the ordered - disordered, the global - local and the causal - teleological oppositions. The details of the relations of the face - edge oppositions will not be analysed here, it is, perhaps, noteworthy that these aspects of quantity - quality concepts would probably be important, for example, in evolution theories. 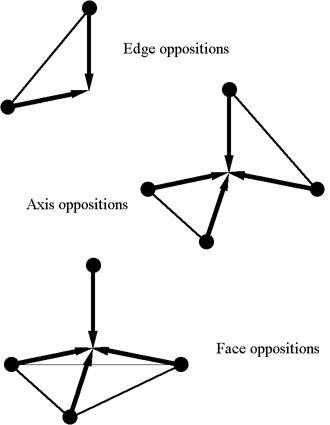 All these are very important relations between the three classes of oppositions, but it would be important to recognise that, at the same time, the reverse relations are working too, i. e., the meaning of an edge opposition is influenced by those axis and face oppositions in which the edge opposition appears. So MASC is a very complex system of concepts, relations and operations. In our view MASC is able to represent all the elements of scientific discourse: the concepts, the statements, the theories, the disciplines, the word views and so on. Some of them preserve their original form in MASC, but most of them have to be reinterpreted applying the view of MASC. So we can use MASC to analyse the conventional scientific practice and products, and following the suggestions of this tetralectics we can construct a new type of knowledge about nature. How is MASC able to reflect the scientific descriptions of our world? There is no room to present all of details here, but a few typical aspects will be mentioned below. In the framework of MASC we can consider the interconnectedness of elements of knowledge produced by the natural sciences. According to the received view the right approach to this problem is to construct more and more universal scientific theories and, finally, science can produce one unified theory which describes all aspects of nature or of a piece of nature at least. However, following this practice science has to face many difficult conceptual and methodological problems. These problems appear at different levels of science. If we take the level of theories, the Gödel theorem causes difficulties; within the specific scientific disciplines some important dualisms (particle - wave, locality - globality, etc.) seem to be problematic; between the different disciplines, the unsatisfactory treatment of the reductionism - holism problem manifests itself; some views and the ideas of natural philosophy are without enough clearness, and so on. MASC tries to treat these difficulties together applying a peculiar methodology to the analysis of natural sciences. This peculiarity appears in both of the - more or less - special elements of the methodology (conceptual analysis, study of analogies, construction of a new disciplinarity, etc. ), and the functioning of MASC in a special way. First of all, the system of the relations of concepts applied in MASC will be outlined here. The relations between the classes of oppositions have already been treated. Now the relation of oppositions and central concepts is the topic. According to MASC all four central concepts have to apply to describe nature, however, most scientific theories do not follow this idea, so they can treat only one or other aspect of it. MASC suggests a tetralectical combination of the different aspects formulated in different theories. The total description is the matter of four different, but interrelated theories, which are built up around the four central concepts. The characteristics of these theories depend on the features of the given central concept. The feature of the central concepts can be characterised by the systems of oppositions of MASC. A central concept is associated with a vertex of a tetrahedron. Three edges meet in a vertex and three axes indicate its position, moreover, a vertex is a basis of a face in tetrahedron. Because of the symmetry operations associated with these geometrical elements representing oppositions, the four central concepts can be characterised by the relevant different set of oppositions. Here we apply a naive topology: in determining the properties of a central concept at a vertex of a tetrahedron, the nearer element from the pair of the opposite will be the dominant contributor. The face oppositions situated at certain central concepts have an eminent role: the main property of the given central concept is determined by this pair of oppositions. In such way we can characterise the concepts of matter, space-time, action and change. 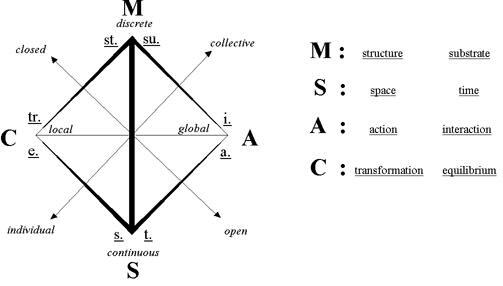 The conceptual structure of these central concepts of MASC seems to be so highly complex that perhaps it would be better to call it a system of concepts or some kind of a theory. However, real scientific theories have a rather close relation to experiences, so seeing that the constituents of this system of concepts or theory in this sense do not have a very concrete content, they are not interpreted in their details, the name metatheory would be more expressive instead of the other ones suggested earlier. We will adopt this idea. So we can speak of four types of metatheories in the tetralectics of MASC: material, space-time, action and change metatheories. In Table 3. the set of the properties associated with the central concepts or metatheories in MASC is presented. According to tetralectics, a metatheory in MASC is not able, even at this high level of complexity, to describe nature, but the system of the four metatheories can do that. Of course, there is a series of symmetry operations to transform them into each other. In such a way the elements of the different metatheories (concepts, statements, laws, problems, theorems, etc.) can be assigned to each other. A great number of analogies can be found, but the different conceptual context makes these theories different ones. The tetralectics of MASC, in fact, is a meta-meta theory, a metatheory for the four metatheories in MASC. It is interesting that its epistemological nature is rather similar to a normal theory than a metatheory. There seems to exist, in this case, some kind of analogy between the dialectical operation of double negation and the doubly applied meta-level view. A comparison of the relevant theories and concepts reveals a deeper connection between MASC and theoretical physics. There are some - more or less - obvious similarities between the metatheories and the physical theory families. However, a very important difference is that each of the physical theory families claim absolute universality in the description of nature, so the different families can be considered as alternatives which exclude each others, whereas metatheories in tetralectics cooperate with each other, and only the whole of MASC claims to its absolute universality. Like in MASC, in the case of conventional physical theories one can also identify some important transformation rules, principles or theorems (i.e., Noether theorem) between the groups of theories, but in the conventional physical theories these transformation rules and theorems do not constitute a clear system, in their appearance, working, form and interrelatedness the contingency has a dominant role. There are some other possibilities to find connections between the MASC and the conventional scientific practice. Sometimes it is interesting to know how a specific scientific concept situated in the conceptual field of tetralectics; which concepts are similar in different scientific theories, and what features are common in them. To study these questions sometimes we have to leave the vertices of the tetrahedron. and we have to move along the direction determined by the very nature of the concept. Not only this results in a more realistic representation of a conventional scientific concept, but it gives a special "fuzzy" features to MASC. Consequently, MASC is a proper tool to find similarities or analogies between the concepts, laws, principles or problems of different disciplines of natural sciences. A theory in MASC gives some relations between the sub-concepts presented here. There are several (but finite) possibilities to find relations between these sub-concepts. We prefer such theories in MASC, whose axioms consist of borrowed constituents from the all the different central concepts. For example an interesting theory can be constructed defining the action - time, space - transformation and the interaction - equilibrium relations. Such theory can be represented by a graph connecting the sub-concepts on the tetrahedron. As a consequence of the general features of MASC, it is clear that we can move between the different theories of MASC by applying the symmetry relations, and these transformations can be represented by the relations of theory-graphs. The domains of validity of these tetralectical theories depend on the chosen sub-concepts, so many very special aspects of the nature can be described with tetralectical theories. The borderlines between the different tetralectical "disciplines" situated in other positions related to the conventional ones. 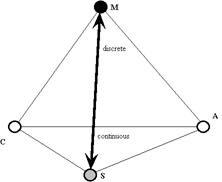 However the details of any kind of concrete theory in MASC is not the topic of this paper. So the tetralectical theories can be very different from the conventional theories because of their very different conceptual structure and their mutual, well-defined relationships to each other, but the practical use of them is the same as that of the standard scientific theories. They have to fulfil the same role in the scientific discourse. In some cases it is more handy to consider the projections of MASC instead of its 3D form. Many interesting consequences became clear if we study only a proper projection of the tetrahedron. Of course, the MASC is equivalent with a definite system of its projections. We can project the tetrahedron into the plane of its two axes along its third axis. These three projections are the most important projections and they are very useful in the scientific analyses. An illustration can be find in Figure 7. Figure 7. The projection of MASC along the the static - dinamic opposition. From the construction rules it is evident that in tetralectics we do not want to describe reality by only one general theory, but we have a three-level description. The lowest level is the level of standard scientific theories. Above this level is the level of metatheories. The highest level in tetralectics is the whole system of tetralectics, which organises the four metatheories into one system. Figure 8. The three levels of tetralectics. The validation of statements is possible at both of these levels but the rules and the results may be different. At the lowest level (the standard scientific theory level) we accept the conventional rules of logic, so we can use all the methods and results of scientific theories. At the middle level, this is not so simple. First we should introduce our non-conventional logical definitions for this level. A statement is true in a metatheory if it was true at the scientific theory level, otherwise we call it not-true. We do not distinguish between a false and an undecidable statement at this level. So there will be not-true statements which are false or which are independent from the axioms of that theory (it is impossible to prove that they are true or false from this set of axioms). Finally we arrive at the top level. A statement is true in tetralectics, if it was true in any of the metatheories (at the middle level). A statement is false in tetralectics, if it was true in none of the four metatheories. At this level the excluded middle principle operates. There is still the question, why use tetralectics? What does it avail? We can get help from the system relations of tetralectics. 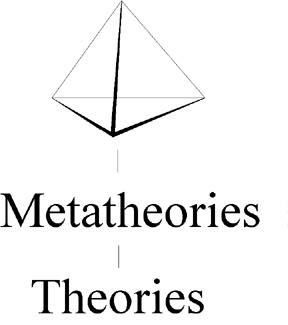 On the level of metatheories we can transform a set of axioms of a metatheory into another one by applying the symmetry relations of the tetrahedron. The problems are not necessarily transformed, but they can be transformed with the same method as the axioms. The statements can be stated in any metatheory, and can be validated as well, the question is only the result. They can be handled much more easily within the framework of tetralectics, because as it was mentioned already, we do not distinguish between the false and the undecidable case. (2) Bolzano-Weierstrass theorem: A continuous function on a closed interval has all the function values between the endpoint function values. Both statements are true in tetralectics. If the axioms contain the integer numbers, then in the first case the transformed axioms of the other metatheory will also contain these axioms without any change, so statement (1) will be true in any metatheory. This is because the prerequisites of the statement are independent from the transformed axioms. However, if we transform the axioms with a symmetry operation reversing the opposition of continuous - discrete, then the situation is quite different in the case of statement (2). The prerequisites of statement (2) contain the continuity so it will be true only in the metatheory of the continuous side of opposition, because this metatheory will contain an axiom defining "continuous". In the discrete side it will not be true, because this other metatheory will contain "not-continuous". If our transformed axioms do not garantee the prerequisites of the statement, for example "continuity", then the theorem will be false. But if the transformed axioms are independent of the prerequisites of the statement, then the statement will be true in the other metatheory as well. So we should transform the axioms by the symmetry relations and deduce the statement from the axioms. If we get the same result, then the changed axiom is not relevant for the statement. If we get the opposite result, then the changed axiom is important in the statement. With this method we can achieve a deeper understanding of the essence of the statements. Such transformations have a crucial role in the famous Gödel theorem. Gödel's incompleteness theorem states, that if we have a set of axioms which is meaningful enough, and the system does not contain contradiction, then we can always construct a statement which is true, but we cannot prove the statement, and cannot prove the opposite of the statement, so this statement is undecidable in this system. The Gödel's incompleteness theorem will be valid at the level of theories. But with tetralectics, there is a chance to transform a so called Gödelian statement into another theory, where it is not necessarily Gödelian even at this level. The proof of the Gödelian theorem is based on the numbering of every axiom and statement. Strikingly, the transformation may change this numbering. This change implies that the formerly Gödelian statement can become decidable, and another statement can become Gödelian. At the meta-meta-level of tetralectics, the Gödelian problems have a quite similar treatment to those of at the level of theories. What is more, the metatheory level may contain apparent contradictions, because it is not a strict theory, but a framework for theories, which consists of concepts, principles and features. For example, the metatheory of geometry (which is not identical with the theory of geometry) contains the axiom of parallels and the negation of the axiom of parallels at the same time. So this means that a metatheory in tetralectics may contain contradictions. In this sense the metatheory concept, and so tetralectics, can be complete without breaking Gödel's incompleteness theorem. As it should be clear from the foregoing, we can live with the Gödel's incompleteness theorem in a new, more friendly way. We presented here some ideas to introduce a new type of logic named tetralectics. How are the features of this logic determined? In any kind of logic there is a formal framework which is, more or less, independent from the contents of its statements. In tetralectics we have four concepts, thirteen pairs of oppositions as the very constituents of this logic, and a collection of the possible operations on these constituents manifested by the symmetry operations of a three dimensional tetrahedron. For the construction of the whole system of tetralectics we have to arrange the four concepts on the vertices and arrange the oppositions on the symmetry elements of tetrahedron. Fixing all of these, a special version of tetralectics is specified and defined. Applying some elementary combinatorics, the exact number of arrangements on the tetrahedron can be calculated getting by this way the possible number of different kinds of tetralectics. In the framework of the given tetralectics there can be identified three levels of the description. The first level, the level of theories is related directly to the world of experiences. In the next level of tetralectics we have four metatheories dealing with the theories, and finally on the third, meta-metatheoretical level we can treat the relations of metatheories. As it concludes from the rules of construction in a concrete version of tetralectics we can construct a definite number of theories, while we have four metatheories and one meta-metatheory. If we want to use this logic to analyse some kinds of phenomena, we have to select four characteristic concepts as central concepts and 13 characteristic pairs of oppositions which probably can characterise the given phenomena. In such a way we can construct and study the tetralectics of different beings. Our presentation given above depicts some details of a tetralectics of natural sciences, which we called tetralectics of MASC. It has also three levels: the level of scientific theories, the level of Material, Action, Space-time and Change metatheories, and the meta-meta level of MASC. We can use this tetralectics as an analysing tool for the conventional scientific theories and, on the other hand, we can construct special kind of tetralectical theories. At this point we can determine again all the tetralectical theories that are possible, and we can use the four metatheories and the whole MASC to study them. Of course, a different view on the essential aspects of natural sciences represented by the different central concepts and oppositions could produce different tetralectics. For analysing other phenomena, we can define their special tetralectics. Any kind of complex phenomenon seems to be a good subject for tetralectical thinking. We have some ideas on the tetralectics of religious systems, social systems, psychological phenomena and the systems of language. Constructing and applying these tetralectics a special kind of complexity and exactness can be simultaneously enforced on the description of these fields - at least in this postmodern logic.